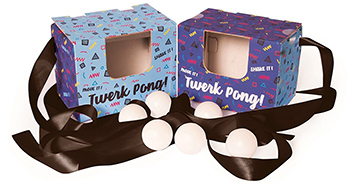 You might think, based on the name, that Twerk Pong would involve some sort of back-and-forth, but it doesn’t. To play, you and another person tie cardboard boxes to your asses and see who can shake the balls out of the box fastest. The end.